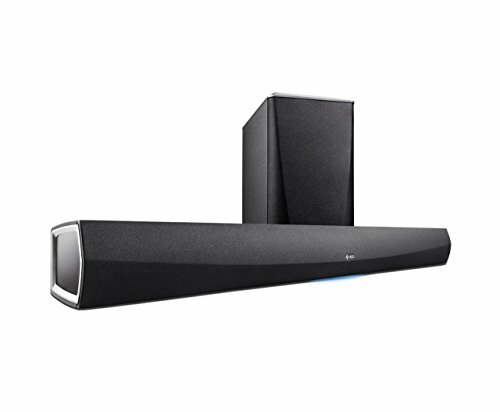 The Denon HEOS HomeCinema 2.1-Channel Wireless Soundbar and Subwoofer System offers wide connectivity options and convenient wireless control. This system consists of a 2.1-channel design, which includes a bi-amplified stereo soundbar and an external wireless subwoofer. The HEOS HomeCinema features dual-band Wi-Fi and Ethernet interfaces for high-speed Internet connectivity. Using the free HEOS app for Android, Kindle, and iOS devices, you can wirelessly stream locally stored content and Internet radio services such as Pandora and Spotify. The app is also designed to enable quick system setup. Box Dimensions (LxWxH) 43.0 x 19.3 x 9.5"